OBE London Gazette 3 June 1955 ‘For public services in Rutland’. Herbert Egerton Whaley was the son of Major C. H. Whaley, and was born in Taplow, Buckinghamshire, in July 1881. He was commissioned Second Lieutenant in the 4th Battalion, Argyll and Sutherland Highlanders in January 1900. He initially served with the Regiment in South Africa, before transferring to the Coldstream Guards as a Lieutenant in May 1901. Whaley was appointed a Sheriff of Rutland in November 1914. 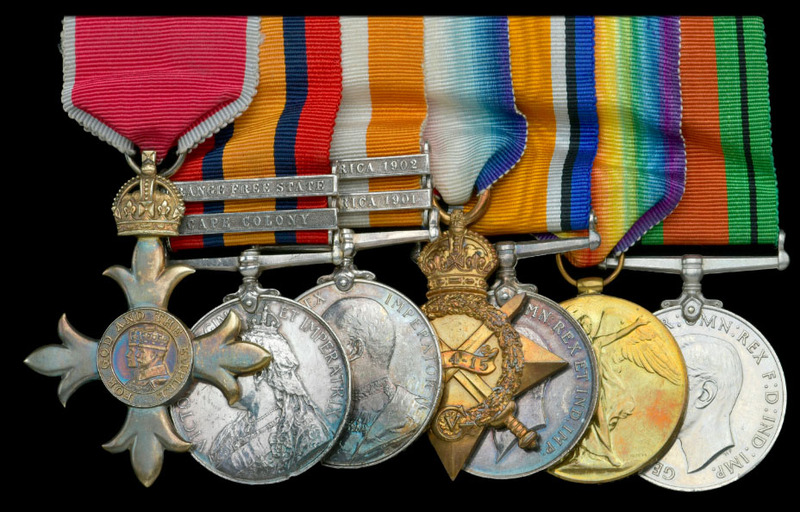 He initially served during the Great War with the Royal Field Artillery in the French theatre of war from March 1915. Whaley subsequently advanced to Major and returned for service with the Coldstream Guards (M.I.D.). He was appointed a Deputy Lieutenant of Rutland in 1944, Vice Lieutenant in 1949, and High Sheriff in 1951. He died in February 1962, and is buried in St. Mary’s Churchyard, Ashwell. I think, for me at least, as a collector, in the case of all three original regiments within the Guards Brigade in 1899, including the Coldstream, I would certainly much rather have a good campaign pair, with the usual eight clasps for service on the western front until Vereeniging.